A personal photo puzzle is a real highlight! 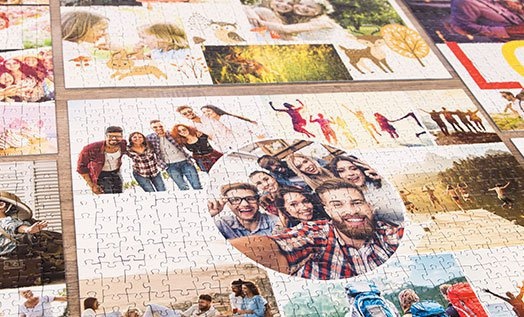 From $34.99 you may turn your favorite photograph into a real jigsaw puzzle. Our selection of 100, 200, 500, 600, 1000 and 2000 pieces offers puzzling fun for everyone - for children and adults, for beginners and profs. Create your unique photo puzzle from unforgettable moments, family portraits, funny snapshots, beautiful holiday memories or artwork of your own, in minutes. Relieve all those wonderful moments and memories again while putting the pieces of your puzzle together. For those who love watching more than reading: In this short movie clip we show how our premium puzzles look, which variants are available and how easy the proceeding of creating a puzzle on your computer is. Get yourself an idea of our good looking boxes and the characteristics of our puzzle pieces - on moving images more catchable, more real. Discover our unique photo puzzle for your most beautiful photographs. Let the curtain rise. It is not always easy to decide which photo will end up on the jigsaw puzzle and sometimes one single photo does not tell the story you would like to show on your photo puzzle. We now offer the possibility to insert lots of photographs into many different layouts and create your own Photo Puzzle Collage. It is the perfect selected outfit that turns your photo puzzle into an impressive gift. How good, that we do deliver this suitable outfit at no additional costs. Our photo puzzle variants with 100 - 2000 pieces come with the puzzle pieces inside a stable puzzle box - with the puzzle image printed on top. With a personal dedication on the cover, your personal photo puzzle is complete. Thanks to a range of 80 different box layouts you are well prepared for every thinkable occasion - our design team has created these layouts with a lot of love for details. We know that you never get a second chance to make a first impression. How good it is to feel that you are in good hands. To give you this feeling we pay the highest attention to the quality characteristics of our photo puzzles - starting with the cutting up to the surface coating. A large number of quality assurance steps guarantee that you will enjoy your photo puzzle, even after many years. For this reason we give you a quality guarantee - without ifs and buts. After all, we are not talking about an ordinary jigsaw; this is all about your very personal premium photo puzzle. To surprise a beloved person is also a happy moment for the one who gives and if it has to be something personal, we think that there is nothing better than a photo puzzle. Valentine's Day, Mother's Day, Easter, Christmas, a birthday, a wedding anniversary - they are all occasions for a very special gift. With a photo puzzle, you will certainly stand out from the others. In fact, it is a kid's play: select your favorite photo, upload it on our website, prepare the box and that's it! In just a few minutes, you turn a photo into a lasting memory for the person being gifted. The puzzling fun starts at $34.99 for a photo puzzle with 100 pieces and ends with our jumbo puzzle with 2000 pieces. A photo puzzle is the perfect gift. Putting a puzzle is good for your health. People that have been putting jigsaw puzzles since ages now have discovered the photo puzzle as a revival of their hobby. Who wants an ordinary puzzle if you can have your own? Puzzles with a personal photo conquer the rooms of America. Why does putting a puzzle bring us such joy at the end? Well, every jigsaw puzzle is some kind of a challenge that we want to take up. A beloved photograph as the main motif on the puzzle is an extra motivation to reach the goal. Puzzle friends confirm that putting a photo puzzle really has a relaxant effect. It is just the most exciting calming down. There are also people that are more focused on the artistic component of a photo puzzle. They shoot an extraordinary landscape photo or paint a picture, have it scanned and turn it into a photo puzzle. It is unnecessary to mention that they do not want to put the puzzle back into the box after having finished the puzzle. How do I choose a photo puzzle? Our range contains photo puzzles with 100, 200, 500, 600, 1000 and 2000 pieces. It is our goal to meet as many requirements as possible, from absolute beginners as well as from professionals. In general, you may say the higher the amount and the smaller the pieces, the more difficult the puzzle will be to put. For this reason photo puzzles with less and larger parts are more suitable for children and the elderly. Although it is quite difficult to estimate and say which puzzle is most suitable for which age, we have prepared an age recommendation on every photo puzzle detail page. First you should decide whether you want to have your photo puzzle with only one photograph or you want to create it with several pictures. Sometimes it is too hard to decide which photo will be the chosen one. After having uploaded a photo, the preview shows with a five star rating if your photo is suitable for the chosen puzzle size. Generally, we may say that the more different colors your photo has, the easier it will be to put. By preparing the puzzle box, you may enter a dedication or a text up to three lines that we print on the cover of the box. 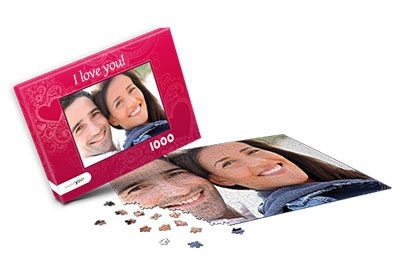 Our Photo Puzzles come with disassembled pieces that have been put in a plastic bag into a individual puzzle box, that may serve as a gift box. 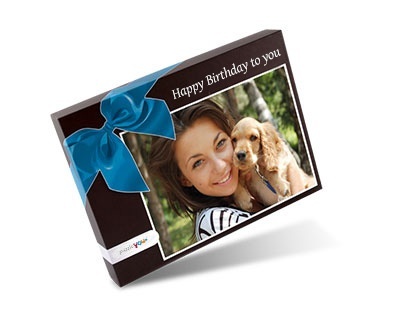 The ordering process allows the picture and a personal dedication to be printed on the cover of the box. 80 different box layouts take care that you will always find the right box for your occasion. If you want the puzzle to be a real surprise, you may even select a box where the uploaded image will not appear on the cover. In that case, the gifted person has to complete the jigsaw in order to see what motif is on the puzzle. After having placed the order, you will receive a confirmation with a link to your personal status site, where you see the actual status of your order and the expected delivery date. After the parcel has been handed over to our shipping partner, we will send you a shipping confirmation with a tracking number.